Les vins allient une matière magnifique et un équilibre parfait. Les tanins garantissent au vin un potentiel de garde important. De grands vins à mettre en cave. 80% Roussanne, 15% Grenache Blanc, 5% Clairette, Marsanne and others. The Rousanne vines are all over 50 years old. Lush ripeness with hints of tropicality on the nose. Impressive weight and depth with an almost creamy texture and with a vibrant acidity which lifts the palate. Profound. Light gold in color, this wine has a phenomenal nose of green olives, dried orange rind, and acacia honey. In the mouth, the wine's satin texture and weighty presence on the tongue bring to mind the voluptuous curves and invisible brush strokes of nudes in Botticelli paintings. Flavors of orange zest, lemon curd, dried mango and dried pineapple swirl amidst a bright acidity and deep resonant minerality that leans towards the saline end of the spectrum. Both rich as well as light on its feet, this is a wine that begs to be swallowed, especially as it lingers for a long while after the fact. Outstanding. 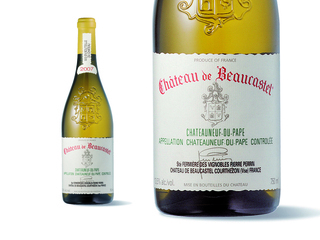 Food Pairing: This is one of the world's most versatile food wines, and will match well with many things. I would love to drink it while eating some spice rubbed grilled quail and figs. The 2007 Chateauneuf du Pape blanc is even better. Meriting the same rating as I gave it last year, it is a delicious, beautifully textured, light gold-colored white revealing plenty of white peach, apricot, nectarine, and honeysuckle notes as well as a distinctive florality and minerality. More honeyed and fuller-bodied than its 2008 counterpart, it should drink beautifully for 7-8 years, then go into an oxidative state. It is somewhat of a gamble as to what will happen thereafter. Parfait nez de miel d'acacia, grande finesse de texture, suavité et fraîcheur splendides, allonge remarquable : un vin éblouissant. Very ripe, but pure and well-defined, with lush mango, dried pineapple, Jonagold apple and Cavaillon melon notes, all laced with heather honey and brioche hints. The long, creamy finish lets a stony note ripple through. Drink now through 2019. 2,000 cases made.